Pronexa Hairgenics Lavish Lash Eyelash Growth Enhancer & Brow Serum with Biotin & Natural Growth Peptides for Long, Thick Lashes and Eyebrows! FDA Approved, Dermatologist Certified & Hypoallergenic. Are you tired of short eyelashes and patchy, thin eyebrows? Do you wish that you didn't have to pile on mascara or use false eye lashes? Forget about eyelash extensions! Get the long and luscious eyelashes you want with Lavish Lash Eyelash growth serum. The secret to longer eyelashes lies in the unique formula made with top-quality and natural ingredients including plant peptides and biotin. Get a huge Lash Boost with Lavish Lash Growth serum today! Our revolutionary botanical serum boosts the length and thickness of eyelashes and eyebrows. The result is longer, fuller and thicker eyelashes and brows! Imparts sheen and luster to lashes and brows making them appear lush and beautiful. No more false lashes needed! Lavish Lash is proven by science. Experience drastic increases in length and thickness of your eyelashes and eyebrows in as little as 60 days for the perfect lash boost! Contains proprietary botanically-derived compounds that penetrate hair follicles to stimulate lash and brow growth which in turn fortifies the eyelashes and brows to noticeably lengthen and thicken them. Lavish Lash is made with only the highest quality ingredients. Everything in our serum is hypoallergenic, non-irritating, clinically tested, allergy tested & dermatologist tested. Never tested on animals and manufactured by FDA certified labs. Easy to apply. Simply place a thin line along the base of your upper and lower lash line once a day at nighttime. Apply only at the root area of eyelashes and as though applying eyeliner and onto clean eyebrows. Combine with our Lavish Liner eyeliner with eyelash growth serum and castor oil for even better results. Use for a minimum of at least 60 days as the eyelashes and brows are the slowest growing hairs on the human body. Your satisfaction is guaranteed or your money back! Babe Lash Eyelash Serum is the perfect product for anyone who has looked in the mirror and thought "I want better lashes!". Which, let's be real, is everyone. Yes, even dudes. It's fine, don't be ashamed. This product uses a lash-friendly formula made with the latest in prostaglandin technology to strengthen and nourish your lashes, making them look and feel amazing! It can also be used on brows! It's easy to use and only needs application once every night. Effortless and luxurious, what more could you want? You want good results right? We re gonna help you get THE BEST results! Like life coaches for your lashes and brows! First off, make sure you use Babe Lash Eyelash Serum once every night. This serum is a night owl and does its best work while you enjoy your sleepy time. Oh and we re talking EVERY night, consistency is key here friends. Your skin and lashes MUST be CLEAN and DRY prior to applying this stuff. It s kinda stubborn that way but let s not question greatness. Remove the wand from the Eyelash Serum tube, and wipe away any excess product. Like talking about your past relationships on a first date, less is more. Make this relationship with your serum last. Next, apply the serum to the skin right above your upper lash line. What about the bottom lashes, you jerks!? you may be asking or even yelling. We haven t forgotten about those lil buddies, and they re going to receive the benefits of the serum without direct application! Seriously! One dip of the wand is enough for both eyes, so you only need one brush stroke for each eye. Bam. Look at you! You re doing it! Perform a patch test by using the product 1-2 times per week for the first two weeks. As with any new cosmetic routine, allow your body to acclimate to the product. Then, gradually bump up the applications to once a night. For full results, use it consistently for 12 weeks. Once lashes are at a good length, slowly reduce to 1-2 times/week. Our best selling lashes are now available in a convenient value pack. Don't run out of your favorite lashes again. An innovative high-performance serum. Contains advanced polypeptides. essential proteins. vitamins. hydrating and rejuvenating ingredients. Helps replenish and correct the appearance of lashes and brows. Adds shine and flexibility to hairs. Creates fuller. longer and healthier looking lashes in just weeks. Ideal for women and men with brittle. weak. thin or short lashes and brows. To use: Apply a thin line of Rapid Lash to the base of the upper eyelash. lower lash line using the applicator brush. Use once daily at night before bedtime. LUSH-LOOKING EYELASHES AND BROWS - Discover how easy it is to get fuller-looking eye lashes and brows, the natural way. 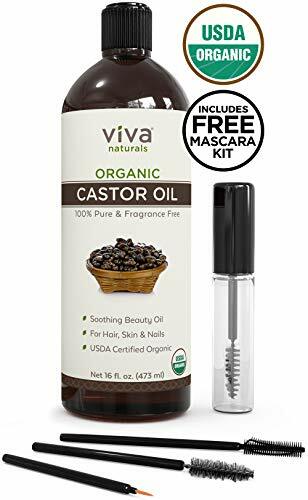 Our organic castor oil makes a great eyelash and brow serum for daily use. HYDRATES HAIR AND SCALP - If it's healthier-looking hair you're after, you know that split ends and breakage can prevent that. Strengthen and repair dry, damaged hair and split ends with Castor Oil. Use a few drops as a soothing, smoothing serum for ends and roots, or add it to shampoo or conditioner for an extra burst of moisture. SOFT, GLOWING SKIN - Your skin needs moisture to retain its elasticity, which is why it can feel dull and tight when it's dry. Used alone or added to lotions, our Organic Castor Oil makes a great skin-softening moisturizer for face and body. USDA ORGANIC AND EXPELLER-PRESSED - Keeping it natural should be easy. That's why we source only high-grade 100% pure hexane free USDA Organic Castor Oil and never add any chemicals, solvents or fragrance. DUO Striplash Adhesive Dark Tone - the World's Best Selling Strip Lash Adhesive! Use DUO Dark Tone Eyelash adhesive on that perfect faux lash. 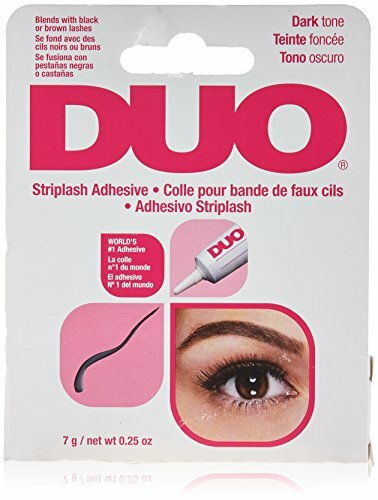 DUO Striplash Adhesive is the world's best selling lash adhesive and has been a favorite of professional makeup artists for decades. 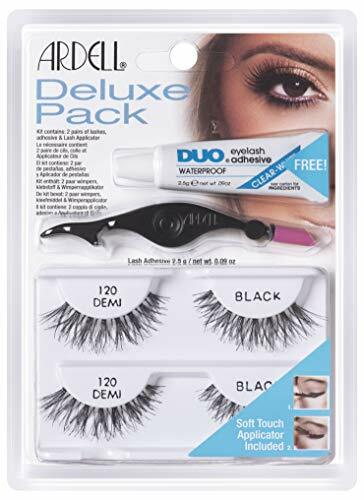 DUO adhesive has a gentle formula that is safe to use and a tiny drop is all you need for those fake lashes to stay in place all day. A single tube of DUO can be used for numerous applications which saves you money. It dries dark and helps hide the lash band to keep your eyes beautiful and your eye makeup perfect! DUO Dark Tone Strip Lash Adhesive lasts several hours and can also be used to apply individual faux lashes. For easy application, apply adhesive to lash and wait 30 seconds for it to become tacky before putting your lashes on. For best results, apply full make up first and lashes last. And apply eyeliner last to blend in the last band. To remove strip lashes that were applied with Duo striplash adhesive, gently peel lash off lid starting at the outer corner. DRIES DARK: Eyelash adhesive that dries dark so if you make a mistake, it just looks like you're wearing liner. EASY TO APPLY: Just squeeze a thin line of DUO adhesive along the lash band, wait 30 seconds and apply lash. 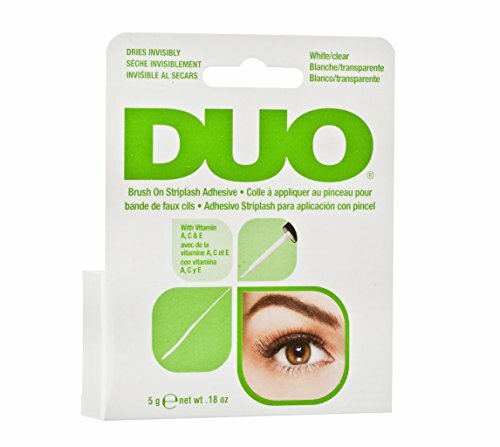 DUO Brush on Strip Lash Adhesive White/Clear - Latex & Formaldehyde Free! This DUO Brush On adhesive comes with an ultra-thin brush for precise, quick application of both strip and individual lashes for all-day wear. Formula contains Vitamin A, C & E and is safe for contact lens wearers and sensitive eyes. To use, simply apply a thin line of adhesive along the strip lash band. Wait 30 seconds to set and apply lashes as close to the eyelid as possible. Secure lash band by pressing onto lash line. This Duo brush on adhesive dries clear and invisible to keep your eye makeup perfect! For best result, apply full makeup first and lashes after. Then apply eyeliner last to blend in the lash band. INVISIBLE: Eyelash brush on adhesive that dries clear to keep your eye makeup perfect! ISO 14001:2015 (environment management) ISO 9001:2015 (quality management) Use the QR code on the back side of the package to visit our store and to check all our products we offer. 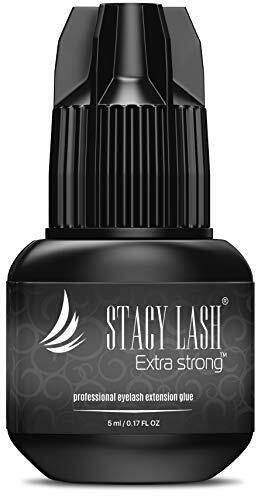 EXTRA STRONG - thanks to the new advanced formula this eyelash extension glue has an incredible retention power, with eyelash extensions lasting up to 7 weeks. Strongest bonding and longest retention period on the market. 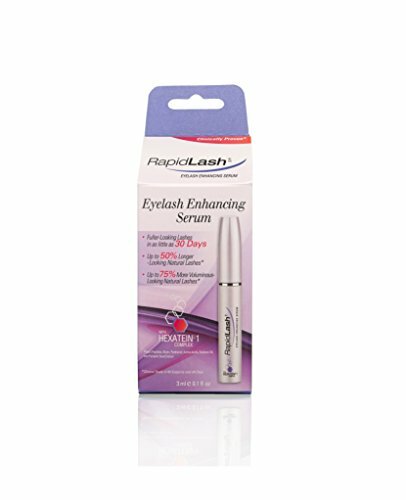 This lash extension glue is the best choice for advanced lash extension stylists. 100% MONEY-BACK GUARANTEE - if you are not 100% satisfied, just contact us and we will do our best for you. The mission of the Stacy Lash brand is to provide the eyelash extension experts with superior quality and premium grade materials to give ultimate highlight to the beauty of the eyes of your clients. Ingredients - aqua/water/eau, poloxamer 184, polysorbate 20, glycerin, propanediol, phenoxyethanol, 1,2-hexanediol, caprylyl glycol, disodium edta, aloe barbadensis leaf juice, panthenol, ethylhexylglycerin, sodium pca, bht, anthemis nobilis flower extract. Ingredient highlights - biopeptin complex. Castor oil has been used for hundreds of years all over the world as a remedy to thinning, stunted hair, help eyelashes and brows appear longer and thicker, as well as fight hair loss. Cold-pressed castor oil contains more omega-6 essential fatty acids, vitamin E, as well as many other vitamins and minerals which provide nutrition to hair follicles. 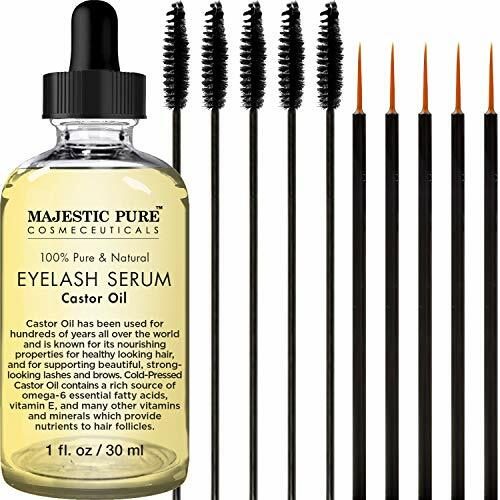 Majestic Pure Castor Oil for Eyelashes Growth Serum consists of 100% pure, natural, and organic castor oil; also effective for eyebrows growth. Etude House My Lash Serum 9 gram. Use alone or under your mascara. Brand: Etude House | Manufacturer: MarginMart, Inc.
LASGOOS have 6 years sales and design experience.This messy/long/fluffy eyelashes is our most popular fake lashes. It was preferred by so many customers all over the world. The 3D style mink lashes look shiny and vivid, which can add a dramatic look to your eye makeup and boom your apperance instantly. If neccessary, apply eye shadow or eyeliner to make your eyeline look more natural. Made of 100% Siberian Mink Fur, Vivid and Shiny and Soft. Package:5 Pairs of 3D Mink Lash. 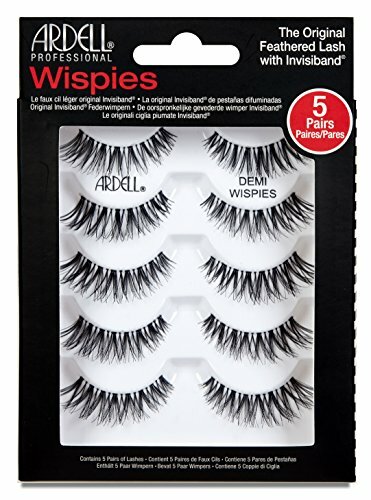 SHORT or SPARSE EYELASHES? Your eyelashes break after mascara dries them out, they are pulled out by the eyelash curler, they are damaged from harsh eyelash extension glue, they are ripped by false lashes, or affected by stress, hormones and medical treatments. Your eyebrows have been aggressively plucked for years and are now thin or showing bald spots. GET LONGER LOOKING LASHES & THICKER LOOKING BROWS! Natural ingredients will nourish and soften them. They will appear defined and beautiful giving you a big-eyed look that is inspiring and hard to turn away from. You will make a different impact with eye contact! Consider buying two for uninterrupted usage. 100,000+ HAVE HAD GREAT EXPERIENCE WITH THIS SERUM. Contains amino-acids that enhance the lashes & brows. Helps maintain healthy and youthful looking lashes and brows. FREE OF color, fragrance, paraben, sulphate, phthalates, SLS, PEG, and gluten. Vegan. Not tested on animals. No prostaglandins. OUR GUARANTEE: For best results, use twice daily for 60 days on clean skin before applying makeup. A small portion of users may not respond to the formula. If you are not happy after using the product for 60 days as recommended, return the bottle for 100% REFUND! May cause a warm or tingling feeling on sensitive skin, which should go away in a few minutes. Before starting to use the product, test a small amount on the skin at the base of the eyelashes and wait 48 hours - if there is no redness, swelling, itching or burning on that spot, it is okay for you to use. RESPONSIBLY FORMULATED. Organys is an eco-friendly skincare brand committed to minimizing waste and working with responsibly sourced ingredients. 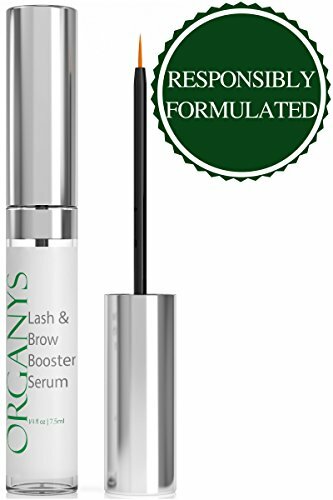 Organys Lash & Brow Serum is responsibly formulated with plant-based ingredients and botanical extracts. We pay premium prices for quality ingredients and keep batches small, so they are always fresh. Get the appearance of longer, thicker-looking lashes you dream of with Lash Boost eyelash-conditioning serum. Get the appearance of lush, longer-looking lashes in as little as four weeks with ENHANCEMENTS Lash Boost. * This nightly eyelash-conditioning serum features a unique proprietary formula that improves the appearance of lash volume and length for lashes that are 100% real, 100% yours. In weeks, you`ll be wondering if you need mascara at all. ENHANCEMENTS Lash Boost should be applied nightly along the upper lash line. Follow these steps: Remove makeup and wash your face before using Lash Boost. Eye lids and lashes should be completely clean and dry. Apply Lash Boost only along the upper lash line of both eyes. Dip the brush once per eye and wipe off any excess product from the brush before applying. Gently wipe off any excess serum from your eyelid or lashes. Do not wash your face or eyes after applying. Wait about 90 seconds until Lash Boost has dried before going to sleep or applying other products around your eye. Make sure to avoid eye lids and lashes when applying any product to the eye area, including eye cream. If you get the serum in your eye, rinse with water. Some people may experience a mild tingling sensation after application. It should improve within a few minutes and disappear completely with continued use. Stop using if tingling, irritation and/or redness persist. 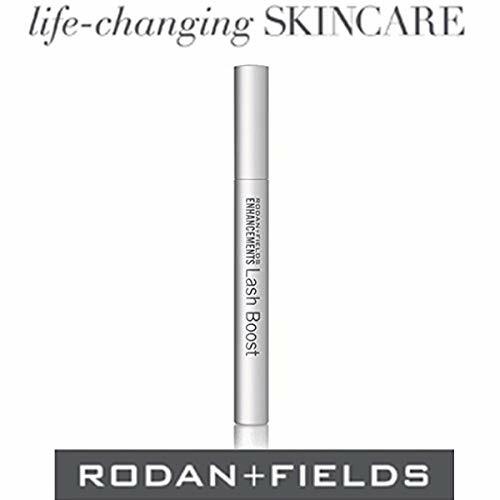 Continue using Lash Boost nightly after desired results are achieved to maintain lash condition. Can also be applied to eyebrows to help improve their appearance. Eyebrows may take up to 8 weeks to see results. Visit our website BeeLineIndustries for more products and comprehensive information about each item. Don't hide your natural look with tons of makeup. Our highly effective formula will make your eyelashes longer & thicker and give extra volume. Besides, the serum really works at regrowing and enhancing both eyebrows and eyelashes. After 30 days you can have thicker, longer lashes and expressive brows. When used regularly, customers notice an increase in the thickness and length of eyelashes after several weeks and a total change after 4-6 weeks. 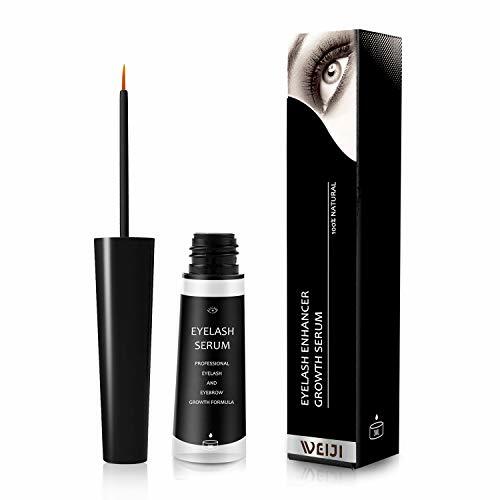 Guarantee: if you are not satisfied with the effects after using this eye lash serum, we'll easily refund you the full price, no questions asked! There is no risk, so try this unique product and enjoy your new look. 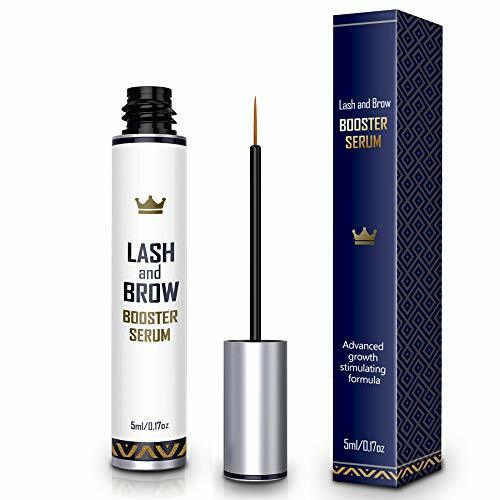 Click "Add to Cart" to get beautiful health eyelashes and natural look with this completely safe and easy to use serum. Instructions: use once a day before going to bed. The treatment area should be absolutely clean and free of other makeup products. Apply to the base of the upper eyelashes, starting from the inner corner of your eye. GET LONGER & THICKER EYELASHES - grow eyelashes faster, regain that gorgeous look with this natural lash growth serum. It gives extra volume even to thick hair. BROW GROWTH STIMULATOR - this lash serum doubles as eyebrow growth booster and stimulate brow growth. Use it on your eyebrow to get thicker Fuller brows you have always dreamed off. AMERICAN MADE - natural enhancing formula, made in the USA, this eyelash serum is totally hypoallergenic and doesn't cause eye or skin irritations and burns. 100% MONEY BACK GUARANTEE - If you are not satisfied with our lash boosting serum, we'll gladly refund you the full price, no questions asked. 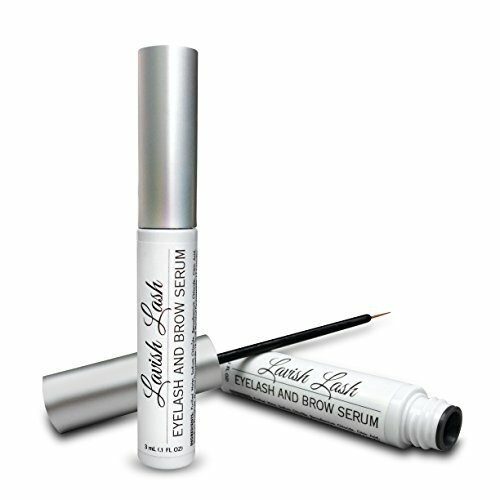 Eyelash Growth Serum will give you long lashes and brows as if you were born with it. You won't need to pile on layers of mascara to achieve naturally beautiful lashes and brows. Our gentle yet effective formula also works great as a conditioner & primer and provides safe & high performance. Protect eyelashes: Activate the dormancy eyelashes, make it longer & thicker, delay the time of exfoliation. Deeply energize hair follicles: Repair hair follicles caused by sticky false eyelashes, grafted eyelashes and tattoos. Consolidate the skin base: Soften and purify the base skin around the eyelashes/eyebrows and improve the eyelash base environment. Nourishing and moisturizing:Provide sufficient nourishment for eyelashes/eyebrows to accelerate the growth of eyelashes/eyebrows. Gentle and non-irritating: It's clinically proven that our products are natural and non irritating, safe and mild, you can apply it without worry about safety. If you are not satisfied after using this product uninterruptedly for 60 days as recommended, feel free to contact us for 100% REFUND. There is literally no risk for you, so don't hesitate to try our eyelash serum. Daily usage is recommended for better result. Tighten the cap after use to prevent the internal liquid from evaporating. We suggest doing a Patch Test on a small area of skin on your neck to make sure the formula is a good fit for you. 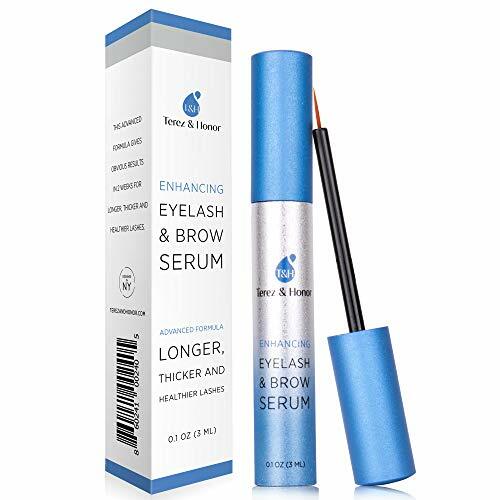 GET LONGER & THICKER EYELASHES - Terez & Honor Eyelash Growth Serum and Brow Enhancer gives extra volume even to your eyelash, grow eyelashes faster. No more false lashes needed! GENTLE and SAFE for ALL SKIN TYPES - Terez & Honor eyelash growth serum is proven by science and natural, experience drastic increases in length and thickness of your eyelashes and eyebrows in as little as 60 days for the perfect lash boost! STRONGER and HEALTHIER HAIR - Terez & Honor eyelash growth serum is made with only the highest quality ingredients. Everything in our serum is hypoallergenic, non-irritating, clinically tested, allergy tested & dermatologist tested. Never tested on animals and manufactured by FDA certified labs. EASY to APPLY - Simply place a thin line along the base of your upper and lower lash line once a day at nighttime. Apply only at the root area of eyelashes and as though applying eyeliner and onto clean eyebrows. 100% MONEY BACK GUARANTEE - If you do not see results, you can return it for a full refund or a replacement. You have nothing to lose so give our eyebrow & eyelash growth serum a try! Your satisfaction is guaranteed or your money back! You finally want a stunning and seductive look with long and thick eyelashes? Thanks to the Lash Eyelash Serum with its optimized complex of active ingredients, you are just a few seconds from the dream of long and thick eyelashes. Step1. The Eyelash growth serum is to be used once daily in the morning and evening before bedtime. Step 2. The eye should be completely cleared of make-up or eye creams Step3. Apply the serum from the inner corner of the eye outwards,directly on the base of your eyelashes. 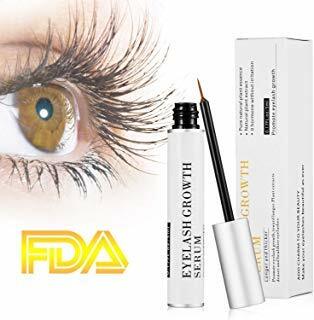 GROW LONGER & FULLER LASHES--Eyelash Growth Serum consists of natural and safe ingredients that penetrate deeply into the hair follicles to promote hair growth, resulting in noticeably stronger, longer and fuller eyelashes and eyebrows. RESULTS WITHIN WEEKS--Many users have achieved noticeable results within 2 weeks of daily use. Those who used it for 6 weeks saw a 55% increase in the total thickness and length of their eyelashes and eyebrows without the need for mascara or false eyelashes. HEALTHIER LASHES & BROWS--Our formula not only enlarges but also nourishes weak and thinning hair healthily. Sparse and over-plucked eyelashes and eyebrows can also be effectively restored with our serum. CLINICAL TEST--Eyelash Serum is non-irritating, hypoallergenic and clinically tested for safety and effectiveness. It is safe and gentle to use every day to boost lash and brow growth and acts as a protective primer under makeup products. Easy to Use--Simply place a thin line along the base of your upper and lower lash line once a day at nighttime. Apply only at the root area of eyelashes and as though applying eyeliner and onto clean eyebrows. Own the natural longer, fuller and healthy eyelashes and eyebrows you desired!!! 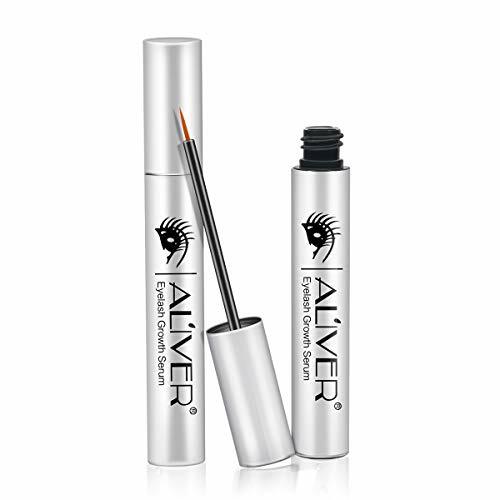 AL'IVER revolutionary botanical serum boosts the length and thickness of eyelashes and eyebrows. The result is longer, fuller and thicker eyelashes and brows! Imparts sheen and luster to lashes and brows making them appear lush and beautiful. No more false lashes needed! Avoid get into eyes. If accidentally consumed, wash your eyes at once. Please keep in original packaging under room temperature and away from sun. General speaking, visible results would be seen in 4-6 weeks. Please know, results vary from person to person, more patience is needed. INTENDED USE- Apply directly onto eyebrows with foam wand applicator twice daily. Use enough to dampen eyebrows and gently massage with fingertips. Results may occur within two months with twice daily usage. For some users, it may take as long as 4 months to see results. Thinning and spotty eyebrows are now a thing of the past thanks to Dr. Balshi's revolutionary Lush Brow. This non-irritating, topical hair growth serum was not tested on animals. It dries clear and is fragrance-free. It simultaneously stimulates hair growth while hindering hair loss. ADVANCED, UNIQUE FORMULA W/ POWERFUL INGREDIENTS- Our natural, botanical serum will enhance the thickness and length of your eyelashes and eyebrows. This will result in beautiful long and full lashes and brows that your friends and family will love! False eyelashes will now be a thing of the past. The Lush Brow lab is FDA approved and our eyelash growth serum is clinically tested and Dermatologist approved. INCREDIBLE SOFT FOAM APPLICATOR TIP- We specially designed our new applicator tip (See Images) on our brush from feedback from 100's of sales from our medical practice clients. It makes applying your eyebrow growth serum to your eyelids or eyebrows, very smooth, non-irritating and comfortable. You will love how easy you may apply the serum and how safe you will be in the process. This is another well thought out item that sets Lush Brow apart from the others. DERMATOLOGIST DEVELOPED FOR MAXIMUM RESULTS!- Lush Brow Serum was developed by Board Certified Dermatologist Dr. Tom Balshi. You may trust that our eyelash growth serum is made with a potent collection of growth factor peptides and a proprietary blend of natural botanicals. It's hypoallergenic, non-irritating, allergy-tested and safe for all skin types. Our eyelash enhancing serum is MADE IN THE USA, has had no animal testing and is the best healthy way to get fuller eyebrows and eyelashes. RISK-FREE MONEY BACK GUARANTEE: We guarantee if you follow instructions carefully, you'll see results in 60 days. Use for a minimum of at least 60 days as the eyelashes and brows are the slowest growing hairs on the human body. Your satisfaction is guaranteed or your money back! 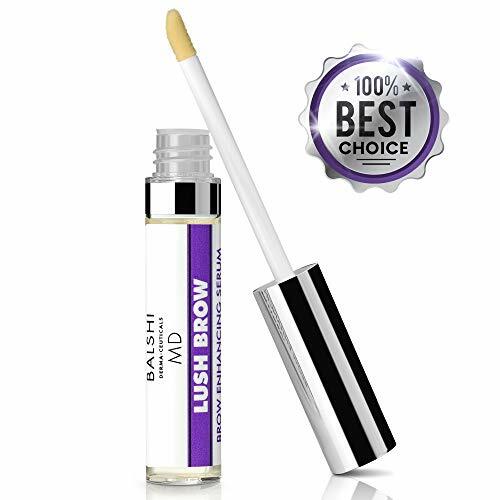 LUSH BROW by Balshi MD Dermaceuticals manufacturers and sells exclusively by itself and has NO RESELLERS. Purchases made through unauthorized resellers do not fall under our manufacturers' warranty. 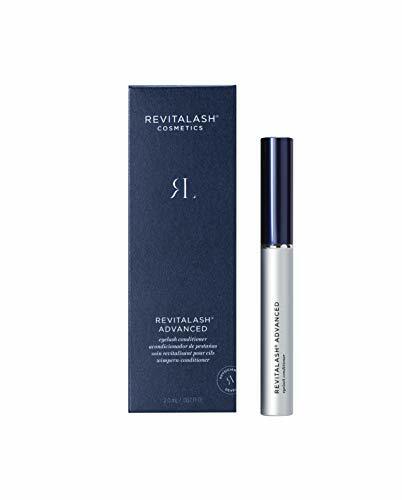 Eyelash Growth Serum,Gentle yet effective formula is designed to help you achieve naturally lush and thick lashes and brows in a safe and healthy way. 1.Daily usage is recommended for better result. 2.For external use only! Avoid contact with eyes! 4.For those with sensitive skin,it is highly suggested to apply some for a try to the skin behind ears before use,and if there no allergy symptoms such as red or itchy skin after 24 hours just use it without risk. 5.If irritation occurs, rinse with cool water and discontinue use. Consult with your physician if you are pregnant or nursing, being treated for any eye-related disorder, or actively undergoing cancer treatment. Nourishing and Natural Ingredients: Pure natural plant essence,Natural plant extract,Our Eyelash Growth Serum contains a variety of plant extracts and natural material, o hormone without irritation,Promote eyelash growth, toward longer Plant extracts denser and healthier eyelashes. 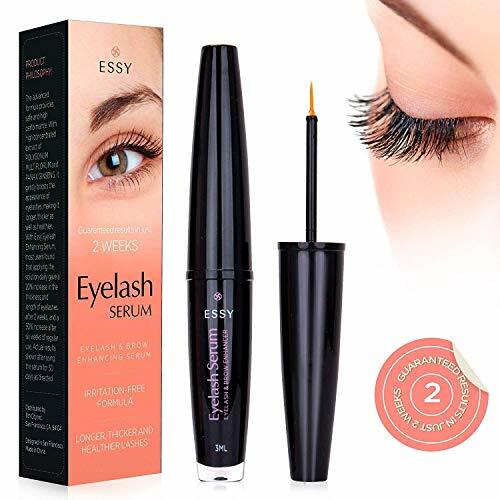 Longer thicker and Healthier Eyelashes: Eyelash growth serum designed to improve the natural growth of eyelashes and eyebrows, making them thicker, longer stronger.Which could effectively help eyelash grow longer, thicker, and give them a fuller healthier look. Easy to apply: Just enough to pick a drop,carefully apply to the upper eyelid of eyelash. Use at least one time per day. Then, smear your eyelash with Eyelash Growth Serum from root to top. Finally, close your eyes two minutes to allow it to be fully absorbed,avoid rubbing your eyes until the serum has dried. Visible Effect: Generally, you will see the change in 20 days if you use this Eyelash Growth Serum regularly. Over 6 weeks of daily use saw a 55% increase of natural eyelashes. Experience drastic increases in length and thickness of your eyelashes and eyebrows in as little as 60 days for the perfect lash boost! Promise: Eyelash Growth Serum is made with only the highest quality ingredients. Everything in our serum is hypoallergenic, non-irritating, clinically tested, allergy tested & dermatologist tested. Never tested on animals and manufactured by FDA certified labs. Description: 1. Perm Dose / # 1 Perm (white): It makes your eyelashes natural and curly. 2. Fixing Dose / # 2 Fixation (cream blue): Hold your curly eyelashes in position for about three months. 3. Nutrition Dose / # 3 Nutrition (yellow): repairs, protects and moisturizes the eyelashes. 4. Cleanser / # 4 Cleanser (transparent): to remove adhesive residue. 5. Silicone pads (5 pairs): fixed eyelashes. 6. Eyelash glue: good viscosity, washable, easy to use. Instructions: 1. Use the cleanser to clean off the oil, dust, and makeup residue. 2. Apply the eye pads on the under eyelids to protect our skin from the perm lotion. 3. Put the lift-pads on the eyelash, then apply the glue on the eyelash to keep it stick on the pads. 4. Use the glue setting the eyelash on the lift-pads about I minutes. 5. Use the #1 perm lotion (white color) on the eyelash and then cover the plastic film about 8-12 minutes. 6. Use the #2 fixing agent (blue color) on the eyelash and then cove the plastic film about 8-12 minutes. 7. Clean the eyelash lift-pads, then use the #3 nutrition lotion (yellow color) to nourish eyelash. 8. Use the #4 cleaning (white transparent color) to clean off all the perm residue. Package including: 1.#1 Perm x 1 2.#2 Fixation x 1 3.#3 Nutrition x 1 4.#4 Cleanser x 1 5.False lashes glue x 1 6.Clean tool (clean off the residue) x 1 7.Lift pads (S/M/M1/M2/L size) x 5 pairs Note: 1. Do not mix with the cotton swab for the different liquids. 2. For the best effect, no facial steam care in 3 days after curing. 3. Avoid contact with the eyes. If something gets in the eye and skin, please rinse with plenty of water. 4. Please keep this product out of the reach of children. 5. Avoid direct sunlight and store this product in a cool place. Safe & Effective:The adhesive is specially designed for use with silicone pads. A gentle fragrance and low irritation, very safe to use. The appearance of longer, thicker eyelashes. Also suitable for short, sparse and straight eyelashes. 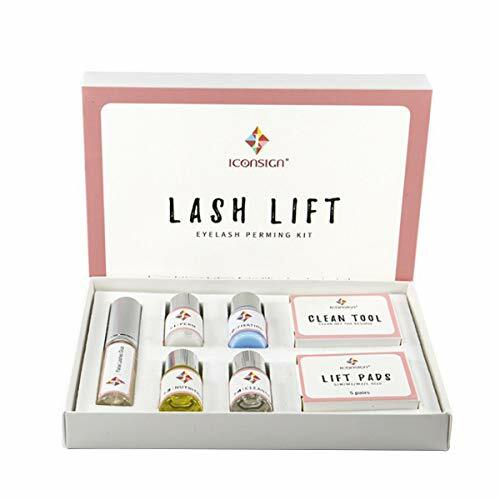 Long life:The eyelash perming kit consists of high quality ingredients. Gives long lasting results to your eyelashes. The eyelash lift is an innovative way to curl eyelashes and make them look younger. Easy to use:This eyelash perm kit uses silicone pads instead of the normal eyelash rollers. Easy to use, it is easier to curl the eyelashes naturally. The kit includes perm means, fixation, nutrition, cleanser, false eyelash glue, cleaning tool and cleaning pad. Give your eyes seductive brilliance and fascinate beautiful wavy eyelashes! The effect of long and curl eyelash can last for a long time. It's perfect for dating, shopping or participating in Halloween parties outside home. Attention: We can assure that our products have been tested and certified. Our eyelash lifting set contains gentle ingredient, however, it is always advisable to carry out an allergy test 24 hours in advance. If you have any questions, do not worry, and please contact us directly. We will give you a satisfied solution.